Absa customers will now be able to use their Twitter account to check their account balance, buy airtime and obtain a mini-statement. 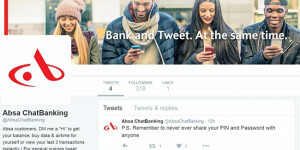 Absa this week introduced ChatBanking, a service that allows users to conduct day-to-day banking through their Twitter accounts. The company claims this is the first service of its kind in Africa. Last month, Absa announced it had plans to pilot a chatbot. As part of the initial offering, Absa customers will be able use ChatBanking to check their account balance, buy airtime and obtain a mini-statement. To access ChatBanking, users will have to set up a profile on Absa's Web site and follow @AbsaChatBanking on Twitter. Once this is done, users need to send a private message to @AbsaChatBanking from Twitter. The bot will respond with banking options. Personal details and account numbers are never displayed in the chat, to protect user information. "This means that even in the event of your cellphone being stolen or someone gaining access to your Twitter account, they would not be able to abuse the information, the same way that someone who picked up your old ATM slip would not be able to use the information on it," says Ashley Veasey, group CIO and chief digital officer at Barclays Africa. He also added airtime and data may only be purchased for the phone number registered with the users' account, "so even if someone took control of your Twitter account, they would not be able to change the information to purchase airtime or data for themselves". Absa hopes to increase offerings and eventually roll out the service to other social media platforms.